I agree, they are really nice. I'm totally in love with that Aminta one! Thank you so much! You are two talented persons too! Mary, those pics are beautiful! I especially love the aminta one; really classy and stylish. I can't wait to see more! Are we allowed to know what those are, or are they secret? 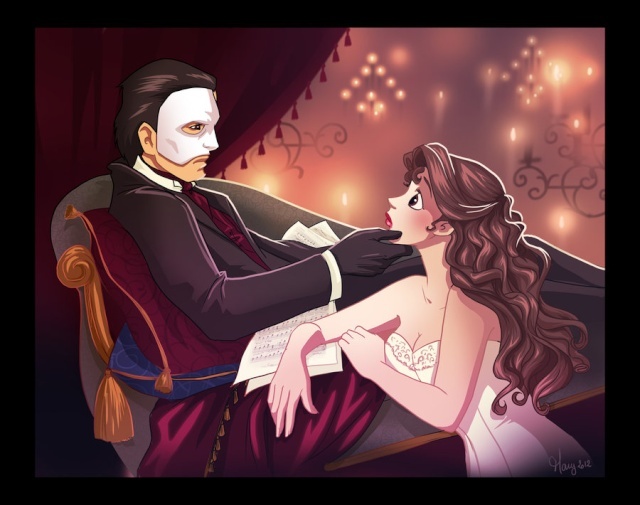 You should do a big PONR one with the Phantom and Christine! I can't draw complicated pictures since I only have my lunch break to draw for me (and I still have commissions to finish - people asking their character drawn by me, etc... It helps me to finance the costume I make during the Week end haha). Aw, please show the sketch! The sylvan glade picture sounds cool. Are you going to focus on a particular production for that pic, or will it just be random? I hope to see more stage-show drawings! The Wishing dress and the Amnita dress are truly beautiful! I love your style. It reminds me of the new Disney Princess's merchandise. You're very talented. Oh, that one's gorgeous! I particularly like the use of highlights for the Phantom's cloak. But I would assume the movie Amadeus, which ALW has admitted served as inspiration for him, also influenced the design. In the Don Giovanni (Don Juan) performed there, they have a long table with red table cloth, decked with finery. Don Giovanni and his servants are dressed in Renaissance styles clothes, and in enters a black draped Death (here in the figure of a statue whom Don Giovanni mockingly invited for dinner). The overall design is not too unlike Phantom's own Don Juan. Down this path into darkness deep as hell!" But I'm digressing.... 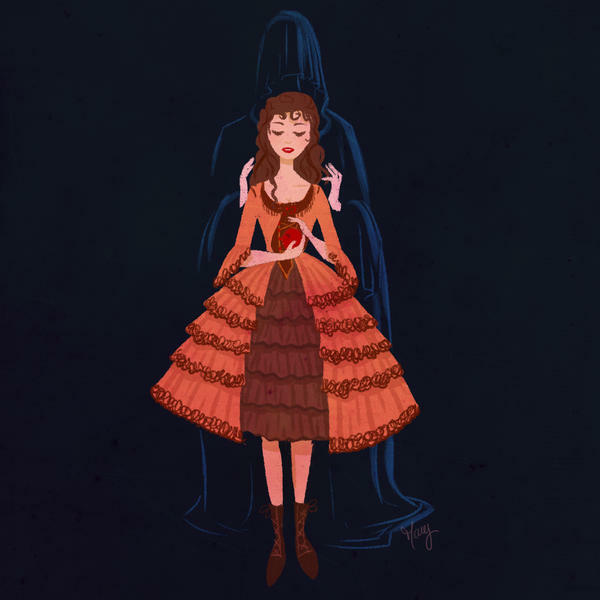 I'm loving the apple PONR new Don Juan illustration! Those are all absolutely beautiful, Mary. I particularly like the pose in the first one. And somewhere, Joel Schumacher is slapping is forehead and saying "That's it! I should have put the midget in the Don Juan scene--that would have fixed everything!" LadyCDaae wrote: And somewhere, Joel Schumacher is slapping is forehead and saying "That's it! I should have put the midget in the Don Juan scene--that would have fixed everything!" After looking at your deviantART page, I soooo want to make Melly's costume from the Painful Day picture. Also, I'm in love with your art nouveau drawings. I just love your style. I somehow missed all the fuss here. Melly, you are quite talented! Love how much fidelity you have to the stage costumes while still retaining your own fun, distinct style. That last PonR one with the shadowing Phantom is really fantastic with the way you've employed the contrasts of warm and cool colors to depict the Phantom and Christine, respectively.